Following the fantastic run by the Cornwall team in this season’s Bill Beaumont Cup in reaching the Twickenham final, it was always going to be a very difficult decision as to whom to vote for as our Cornwall Player of the Year. There were so many candidates throughout the team who put their hands up as potential winners. In the end a close poll saw REDRUTH PROP FORWARD DARREN JACQUES emerge as the player with the most votes, narrowly defeating two former winners of the award, skipper Ben Hilton in second place and Sam Hocking, third. The cornerstone for any side is it’s pack, the front row is where it all begins. Jacqusey excels not only in the tight but also in the loose as a fine all round player. He has for many seasons been one of the crowd’s favourites and this award fully justifies his commitment and service to the Cornwall team. Jacques has been a stalwart of the Redruth pack for many seasons and captained the Reds from 2009-11. This season saw him notch his 25th county appearance. 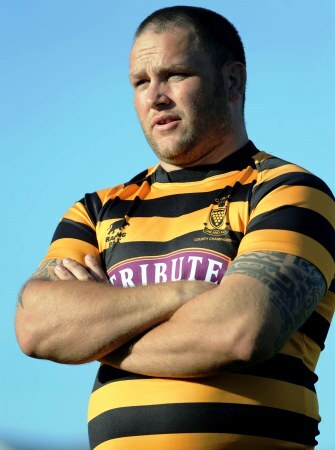 The winner of the TONY MEAD MEMORIAL SHIELD CORNWALL U.20 PLAYER goes to last season’s Cornwall U.20’s skipper NEIL BROADBANK who also plays for REDRUTH. Broadbank a fine flanker made a few appearances for the Reds during their National League 2 South campaign last season. He also made the final trials for England Counties U.20 squad narrowly missing out on selection for the tour to Georgia. Broadbank is currently at university in Exeter. …..Always grateful…”Up The Line” Stuart….as my Faather used to say!